Most of consumer behavior is perfectly obvious -- people like things that look nicer, taste better, work more dependably, and cost less. Then there's the mysterious part. And what we claim to understand about the mysterious part is usually speculation and ideology masquerading as knowledge. 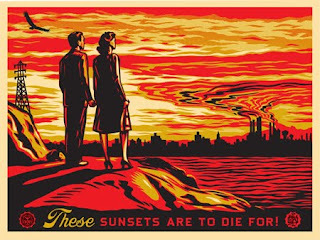 About the Image: Sunsets to Die For, Shepard Fairey. What the dickens is "Inklust"? Boy am I glad you asked. Here's the manifesto: part I and part II. Hmmmm... this got me thinking.